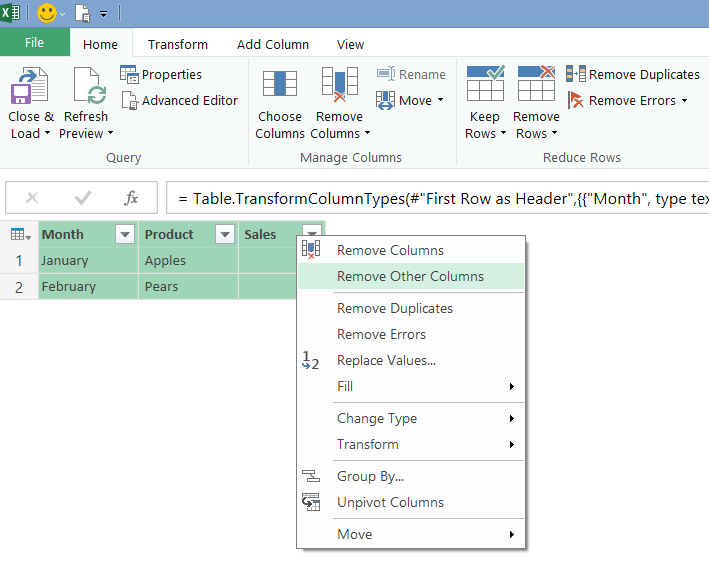 A recent conversation in the comments of this blog post brought up the subject of how to handle columns that have either been removed from or added to a data source in Power Query. Anyone who has worked with csv files knows that they have a nasty habit of changing format even when they aren’t supposed to, and added or removed columns can cause all kinds of problems downstream. This means that if any new columns are added to your data source in the future, they won’t appear in the output of your query. In the M code the Table.SelectColumns() function is used to do this. 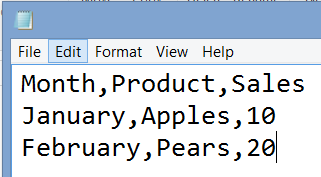 You can then store the output of this query in an Excel table for future reference – just remember not to refresh the query! 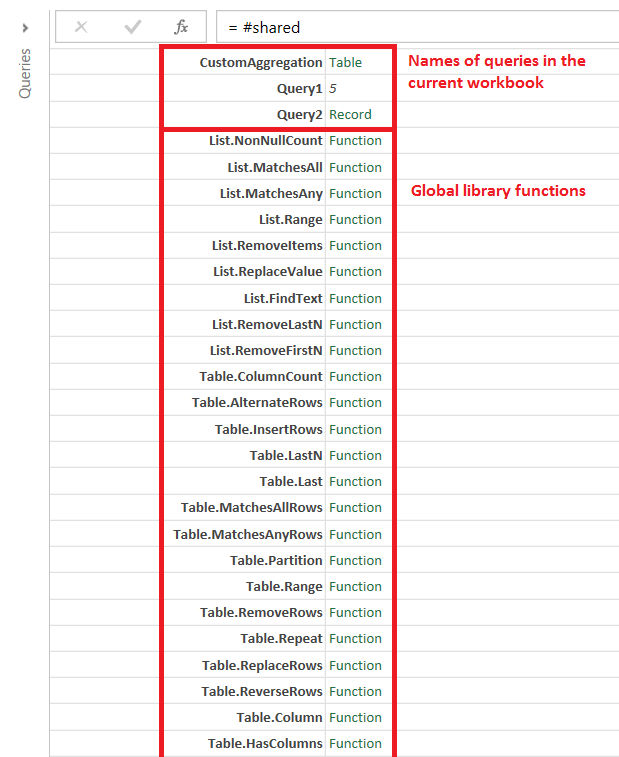 It would be very easy to convert this query to a function that you could use to check the columns expected by multiple queries, and also to adapt the output to your own needs. Also, in certain scenarios (such as when you’re importing data from SQL Server) you might also want to check the data types used by the columns; I’ll leave that for another blog post though. In any case, data types aren’t so much of an issue with CSV files because it’s Power Query that imposes the types on the columns within a query, and any type conversion issues can be dealt with by Power Query’s error handling functionality (see Gerhard Brueckl’s post on this topic, for example). You can download a workbook containing the two queries from this post here. The Fact Internet Sales measure group contains sales data; the Product, Date and Customer dimensions are what you would expect; Sales Order is a fact dimension with one member for each sales transaction and therefore one member for each row in the fact table that Fact Internet Sales is built from. Each Sales Order can be associated with zero to many Sales Reasons, and the Sales Reason dimension has a many-to-many relationship with the Fact Internet Sales measure group through the Fact Internet Sales Reason measure group. Only the Sales Order dimension connects directly to both the Fact Internet Sales Reason and Fact Internet Sales measure groups. Given that the Sales Order dimension is a large one (in this case around 60000 members – and large fact dimensions are quite common with many-to-many relationships) it’s likely that one Sales Reason will be associated with thousands of Sales Orders, and therefore SSAS will have to do a lot of work to resolve the relationship. This is not an assumption you can make for all many-to-many relationships, for sure, but it’s certainly true for a significant proportion. The much lower numbers for ROWS_SCANNED and ROWS_RETURNED shows that the Storage Engine is doing a lot less work. For the amount of data in Adventure Works the difference in query performance is negligible, but in the real world I’ve seen this optimisation make a massive difference to performance, resulting in queries running up to 15 times faster. Don’t forget that there are many other ways of optimising many-to-many relationships such as the those described in this white paper. Also, if you have a large fact dimension, if it does not need to be visible to the end user and is only needed to make the many-to-many relationship work, you can reduce the overhead of processing it by breaking it up into multiple smaller dimensions as described here. I haven’t been shy about stating my support for the PASS BA conference and the associated efforts by PASS to reach out beyond its traditional audience to analysts and other power users (see here for example). I won’t bore you with my opinions again, except to say that at the third attempt I think PASS have got the balance of session topics right at the upcoming PASS BA conference in Santa Clara this April. There’s a stellar team of Excel speakers, including Mr Excel and Chandoo. There’s David Smith from Revolution Analytics, the company bought by Microsoft recently; plenty of sessions on predictive analytics; various Microsoft dev teams will be out in force; and Marco Russo and I will be speaking too. I think it promises to be a great conference, definitely not a PASS BI conference, and very different from the PASS Summit. You can register here, and using the code BASPCHR will give you a $150 discount. This license transition should not interrupt access to the Power BI service. A year ago I wrote a post on loading the M code for a Power Query query from a text file using the Expression.Evaluate() function, but I admit that at the time I didn’t understand how it worked properly. I’ve now had a chance to look at this function in more detail and thought it might be a good idea to post a few more examples of how it works to add to what’s in the Library spec. The docs are clear about Expression.Evaluate does: it takes some text containing an M expression and evaluates that expression, returning the result. The important thing to remember here is that an M expression can be more than just a single line of code – a Power Query query is in fact a single expression, and that’s why I was able to execute one using Expression.Evaluate() in the blog post referenced above. OK, so far not very interesting. What we really want to do is evaluate more complex M expressions. Reza Rad has a blog post devoted to this which is worth checking out. In this example you can see that the two variable names present in the text passed to the first parameter of Expression.Evaluate() are present in the record used in the second parameter, where they are paired up with the two variables from the main query whose values they use. If I Could Have New Features In SSAS Multidimensional, What Would They Be? Indulge me for a moment, please. Let’s imagine that somewhere in Microsoft, someone is planning for SQL Server v.next and is considering investing in new features for SSAS Multidimensional (don’t laugh – I wouldn’t be writing this post if I didn’t think it was a possibility). What features should they be? Before I answer that question, it’s worth pointing out that despite what you might think there has been some investment in SSAS Multidimensional over the last few years. This post lists what was new in SSAS 2012 Multidimensional; since then support for DAX queries has been added and, umm, the new Divide() function. This must have been a lot of work for someone – but why does it get overlooked? One reason: none of these changes have made much difference to the ordinary SSAS Multidimensional developer’s life. DAX query support is great if you’re one of the few people that uses the SharePoint version of Power View; shockingly, it still doesn’t work in Excel 2013 Power View yet (though I guess it will be the way the new Power BI connects to on-prem Multidimensional). NUMA support is great if you work for an investment bank and have vast amounts of data and a high-spec server, but that’s only about 0.1% of the installed base. There are a limited resources (time and developers) available and Power Pivot/SSAS Tabular will be the priority, so only a few features can be delivered. With all of that borne in mind, here’s what I would choose to implement based on what I see as a consultant and from the popularity of particular topics on my blog. One of the most popular posts I’ve ever written – by a gigantic margin – is this one on the last-ever non-empty problem. Given that so many people seem to come up against this, and that the MDX solution is complex and still doesn’t perform brilliantly, I think it should be built into the engine as a new semi-additive aggregation type. Since semi-additive measures are Enterprise Edition only, this would be my sole Enterprise Edition feature. Ever since I’ve been working with SSAS, people have always asked why the Formula Engine has been single-threaded. I understand why the SSAS dev team have ignored this question and instead concentrated on tuning specific scenarios: doing parallelism properly would be extremely difficult given the way MDX calculations can be layered over each other, and in plenty of cases it could lead to worse performance, not better. However I’m not asking for a ‘proper’ implementation of parallelism. I just want something dumb: a boolean property that you can set on a calculation that tells the Formula Engine to do this calculation on a separate thread. If it makes performance better then great; if not, then don’t set it. My guess is that even a crude implementation like this could make a gigantic difference to performance on many calculation-heavy cubes. It should work with calculated members. I don’t expect SSAS to understand magically how to work out which rows to display for any given MDX calculation, but I would like a way of specifying in MDX what those rows should be. Those stupid, ugly column names – SSDT should let us specify readable column names and let us have complete control over the order they appear in. Excel should allow drillthrough on multiselect filters. This might seem a bit of a strange choice, and I suspect it may not be easy to implement, but another problem that I come across a lot in my consultancy is the ‘events-in-progress’ problem. I’ve blogged about solving it in MDX and DAX, as have many others. I would love to see a new ‘between’ dimension/measure group relationship type to solve this. In fact, competing OLAP vendor iccube already implemented this and you can see how it works on that platform here and here. My feeling is that this would open up a massive number of modelling opportunities, almost as many as many-to-many relationships. And that’s it, four features that I think could make SSAS Multidimensional v.next a must-have upgrade. I’m not so naive to believe that any or all of these will be implemented, or even that we’ll get any new features at all, but who knows? If you have any other suggestions, please leave a comment.